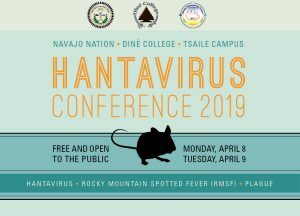 The Hantavirus Conference was a great success, bringing together public health workers from Navajo Nation, tribal and state Departments of Health, Indian Health Services, the Centers for Disease Control and Prevention, and other agencies and institutions. We give a big thanks to all who participated and helped with the Conference. We are happy to share the PowerPoint presentations given by experts during the Hantavirus Conference. These are below. Just click to begin the downloading process. Videos are available for viewing as well. Just click on the link to play the video. Overview/update of hantavirus epidemiology and other diseases (RMSF, plague) on NN; role of NEC; reports and data sets; website; partners: IHS, CDC, Diné College, states; emergencies and notification; outreach/NIDET calls; resources on NN. Recent ecological (elevation, habitat) and epidemiologic information on deer mice populations; GIS and human cases of HV on Navajo Nation.